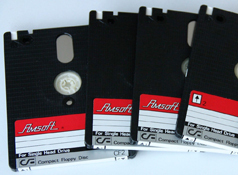 All disks offered (except new, sealed disks) are used, but are re-formatted as data, verified and tested on an Amstrad 6128 and re-labelled as necessary. They can of course be re-formatted for any machine which uses the 3" disk drive. Old labels which were not removable may be present on the disks or beneath the new labels.